A New Beginners class will be starting again in the near future. Please do let me know if you’d be interested in attending ! This class will be suitable for beginners, those with a little yoga experience or those who might have been away from practice for a while and are looking for a class to re-acquaint themselves with Yoga. This class has been running now for approximately 6 years. Some of my students in this class have been practicing Yoga for many years. In this class we are able to explore some of the more esoteric aspects of yoga such as working with the Chakras, Bandhas, Meditation & Pranayama practices. The class is very welcoming and inclusive to new members, so if you have some Yoga experience and are looking for a new class this one might suit you better than the earlier class. This class will be a fusion of Restorative & Yin style yoga. Together with the practices of Pranayama (breathing techniques), Meditation and Yoga Nidra, this two & half hour class will offer an opportunity to truly explore, indulge and experience the benefits of a deeply healing and restorative practice. Yoga Nidra (yogic sleep) is a systematic method of inducing complete mental, emotional and physical relaxation. As a monthly class, there is no need to sign up for regular attendance, simply come along when you can. 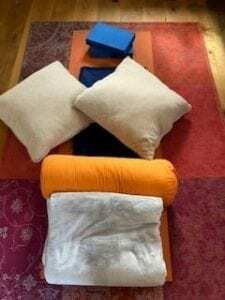 As we will be using ‘props’ and supports to help us access ease and comfort in both the asana work and in the relaxation, it will greatly help your practice if you can bring 2 blankets, 2 yoga blocks and at least one cushion, a bolster if you have one. (quite frankly the more you can bring the better!) If you don’t have easy access to any of these props, I will have a small supply of spares with me on the day. I am looking forward to welcoming you and guiding you through a deeply restful & restorative practice. You are most welcome to come along to this class whether you are a regular student of mine or not. Please don’t hesitate to get in touch with me if you have any doubts about the suitability of this class for you .You must be over 18. *if you don’t currently attend one of my regular yoga classes, you will need to complete a registration form, this can be downloaded below and will save time on the day. 2019 – 27th January, 24th February, 24th March, 23rd June, 22nd September, 27th October, 24th November. Please do contact me with any questions you might have about any of my classes. Classes tend to run along Derbyshire County Council Term dates with some exceptions for holidays and training. Weekly classes are currently priced at £7.00 each payable half termly in advance, except for new students who may pay weekly for the their first half term only. Keep up to date with my classes and workshops.